The ONW is looking for volunteers! We want people who like trains and want to share their passion with others. 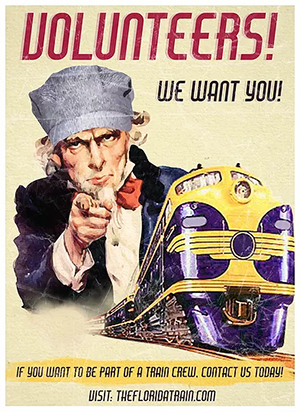 We are looking for men, women and young adults in many different areas, including conductors, locomotive engineers, people to portray the 1940s and 50s, actors, dancers, singers, mechanics, decorators, bartenders, teachers, docents, and even things we haven’t thought of yet! The ONW has a strong safety culture and yet we enjoy having fun and want to share our enthusiasm for what we do. Hours are flexible, of course, and we will provide teaching, training and mentoring. While some of these positions require extensive training and responsibility, others can be learned quickly and easily. You too can “board a train into history”, not just as a passenger, but as an active participant in the process! Our Polar Express TM trains are already well known for the magical experience they provide to families, and for those who believe, you too can be part of creating the magic. Call us and learn more about becoming a part of the Royal Palm Experience! A special shout out to railroaders: We understand that this industry gets in your blood, and we have a healthy respect for the impact is having on one’s soul. If you are an experienced railroader and want to go “back into service” a bit, please contact us. The qualification process is as rigorous as most railroads (and more than some), but we will work with you to take full advantage of your prior experience and training. We can use certified engineers and conductors, and with a reasonable commitment, will work through the recertification process if your certification has expired, etc. We are proud of our approach to old-fashioned railroading with a modern commitment to safety. Please note: As many companies do, we perform background checks and our volunteers are subject to the same drug and alcohol testing as our employees are. TThe Orlando and Northwestern Railway runs up to seven days a week depending on the season. We also offer a variety of specially themed events that incorporate our classic railroad equipment. You don’t have to be a train enthusiast to enjoy being a part of the operation. We do count on a professional attitude, a team spirit and an unwavering commitment to safety.